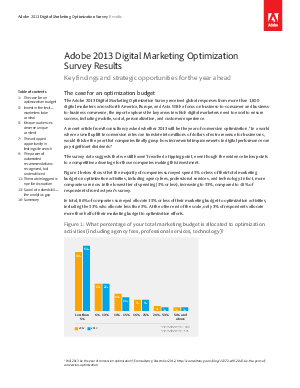 The Adobe 2013 Digital Marketing Optimization Survey received global responses from more than 1,800 digital marketers across North America, Europe, and Asia. With a focus on business-to-consumer and business-to-business commerce, the report explores the key areas in which digital marketers need to excel to ensure success, including mobile, social, personalization, and customer experience. A recent article from Econsultancy asked whether 2013 will be the year of conversion optimization.1 In a world where a small uplift in conversion rates can translate into millions of dollars of extra revenue for businesses, would this be the year that companies finally grasp how incremental improvements in digital performance can pay significant dividends? The survey data suggests that we still haven’t reached a tipping point, even though the evidence below points to a competitive advantage for those companies making this investment.